CAPS ARE STANLEY CUP CHAMPIONS!!! Our very own Washington Capitals have made it to the Stanley Cup Finals! 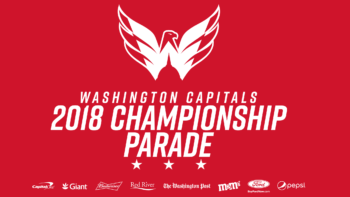 A parade is being planned for Tuesday, June 12 beginning at 11am at Constitution Avenue & 17th Street NW and will proceed along Constitution Avenue to 7th Street, where it will turn right and culminate in an ALLCAPS rally at 7th Street and the National Mall. Check the events tab for further updates. Below, please find the latest information collected by the DowntownDC Business Improvement District (BID) on street closures, traffic updates, safety alerts and other information related to DowntownDC activities May 29-June 12, 2018 for the Washington Capitals. This page will be regularly updated with the latest information from the DC Metropolitan Police Department (MPD), the District Department of Transportation (DDOT), the Washington Area Metropolitan Area Transit Authority (WMATA), the Executive Office of the Mayor, Monumental Sports & Entertainment, Capital One Arena and other partners and agencies involved in making this special event a huge success. You can visit the District of Columbia’s Stanley Cup Finals page https://dc.gov/caps for more information. Members of the public are encouraged to sign up for text alerts to receive safety, transit, and weather updates from the District on days when the Stanley Cup games are being played in Washington, DC. Text “ALLCAPS” to 888-777 to sign-up. Subscribe at the bottom of this page to receive DowntownDC real-time Washington Capitals alerts from the BID in your inbox. Please Note: Information below is subject to change. Event organizers are expecting large crowds, requiring significant street closures. 7th Street on the National Mall will be closed to all traffic beginning at 6:30pm on Monday, June 11, between Constitution and Independence avenues. The Metropolitan Police Department (MPD) expects most streets to re-open to traffic by 3:30pm on Tuesday, but that will be dependent upon crowds and conditions along the parade route. 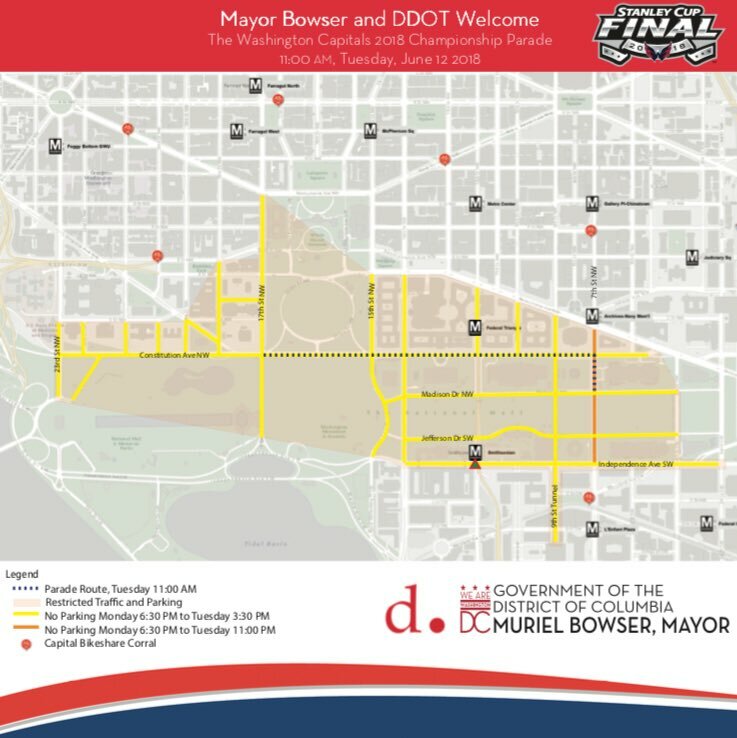 The parade will travel along Constitution Avenue NW, beginning at 17th Street NW, proceeding to 7th Street NW, and then turning south to end with a rally on the National Mall at 7th Street (refer to the dotted line in the map above). The parade and rally will be free and open to the public. Organizers for the June 12 parade are expecting large crowds. Use of Metrorail is strongly encouraged for attendees. Metro will be running rush-hour levels of service all day to accommodate attendees. Regular fare policies will remain in effect, with off-peak fares charged between 9:30am and 3pm. The parade route is accessible from many Metro stations, including Archives, Federal Triangle, Metro Center, Federal Center SW, L’Enfant Plaza, Gallery Place-Chinatown, and Smithsonian. To avoid crowding at the transfer stations, Metro recommends that passengers select a destination near the parade on the same line as the start of your trip. Metro Transit Police may temporarily restrict access to stations for crowd control purposes, including designating some station entrances as ‘exit only’ or ‘entry only.’ Trains may also bypass stations if their platforms are too crowded. Because the parade is talking place on a weekday, Metro expects most of their parking lots to fill up with regular commuters. Parade attendees wishing to park-and-ride should plan for alternative parking locations. Parking fees will be charged to all vehicles. Capital Bikeshare users will be able to take advantage of corrals at key CaBi stations near the parade route (shown in red dots in the map above). CaBi riders will be guaranteed the ability to dock their bikes at these stations and then walk to the parade. I’m a resident. Do I have vehicular access to the restricted area surrounding Capital One Arena? There will be limited vehicular access for residents and monthly parking pass holders in the area on 6th Street NW from E Street NW to H Street NW. No unauthorized parking will be permitted in the no-parking area. How can delivery vehicles access the restricted area? What about valet parking options that are typically offered for establishments within the restricted area? Valet parking will be moving on a case-by-case basis and MPD is having ongoing discussions with establishments to relocate their valet parking. All visitors are strongly encouraged to utilize Metrorail during home games. Where can taxicabs and Transportation Network Companies (TNC’s) such as Uber and Lyft pick up and drop off near the arena? The District is strongly encouraging TNCs to pick-up and drop-off outside of the perimeter. Within the perimeter, the installation of Emergency No Parking (ENP) signs should provide curb access on many streets. Within the perimeter, preferred TNC locations are G Street NW east of 5th Street and 9th Street NW. All visitors to the arena are strongly encouraged to utilized Metrorail. Are Metrobus and other surface transit providers being rerouted around the restricted area?